As a fan of obscure and out-of-the-way composers, I already possess several discs of music by Louise Farrenc, so it was nice to be given the opportunity to review another one. Farrenc’s music seems to be undergoing something of resurgence these days, perhaps partly due to the massively increased publicity given to female composers over the last few years. Thus, her exposure to the listening public has increased too, and the recording industry has responded by releasing recordings of her works. I am grateful that this has happened, as her compositions, especially her symphonies and chamber works, are masterpieces. 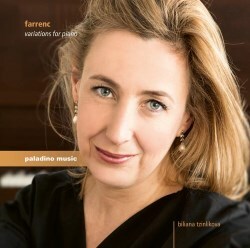 On this disc, we find Farrenc working on a smaller scale with her primary instrument, the piano, and in a form common for the period of time in which she was living – that of variations. The first piece on the disc is a lively set of variations on a theme (with which I am unfamiliar) by Donizetti, published as Farrenc’s Op.15. These start with an interesting introduction before the theme itself starts properly. This is a beautiful cantabile melody which is wonderfully nuanced and played. This gradually builds in power before the proper variations start. These are of varying length and tempo; the variation starting at about 3’10’’ requires a very clear right hand and a very bouncy left one to provide the accompaniment, and makes an excellent foil for the following march-like variation with added thirds in the right hand, just to add some more difficulty. The slower, mournful variation at 7’25’’ is particularly interesting; there is real pathos here. The closing pages and variations require considerable virtuosity and are full of cross rhythms and interplay between the hands, all coped with splendidly. Overall, this is a rather impressive set of variations with plenty of different moods and interesting structural changes. It’s all not particularly serious, just well written and excellently played. Second on this disc are the “Variations on a Russian theme” which was, according to the notes, her first big hit. This piece, which is probably on an original theme by Farrenc received positive feedback from Robert Schumann, although he didn’t like the virtuosic ending. Anyway, the introduction is rather austere sounding and clearly in a minor key before the eight variations get started properly. In variation 1, there is a rather nice little passage about two and a half minutes in, which shows the composer’s ability well. The following two variations are loud, fast and difficult in a good contrast to the next one which is rather reflective and peaceful. Again, complex passagework returns for the fourth variation, with the theme concentrated in the left hand. Variation 5 is much quieter with loud outbursts towards the end. The following variation is almost like a Czerny etude and puts me in mind of his variation from Liszt’s “Héxameron” (S392). Next follows a complex fugal sounding variation which contains plenty of difficult work before a proper Fugue which builds to an impressive climax and dissolves to a powerful statement of the main theme embellished with lots of difficulties. The concluding pages (and final variation) are initially rather quiet and reflective before leading to a rousing conclusion. Track 3 is the longest work on the disc but runs to only seventeen and a half minutes and is the rather impressive “Grand variations on a theme by the Count Gallenberg” of whom prior to this, I had not heard. Fortunately, the cover notes give a few details about him which do help. In terms of style, Chopin is a clear influence here, the piece is similar in structure to Chopin’s Op.2 Variations on “La ci darem la mano”, complete with the orchestral interjections arranged for solo piano. The piece starts (appropriately) rather grandly with a short introduction which you could imagine being played by full orchestra, before a wistful theme begins. This extensive introductory passage and the following statement of the main theme means that the variations proper do not begin until over four minutes in and when it does, there is lots of leaping about for the soloist before the following variation slows things down again. This, in turn, leads to a faster, more fugal-sounding variation which then quickly dissipates into an evocative slow variation. Generally, the pattern is one of fast – slow – fast throughout the piece but there is plenty to keep the listener entertained throughout. I especially like the variation at around ten minutes in which is full of alternating trills and legato passages which leads to another enjoyable variation which occurs at 12’48’’ – this is a rather pompous march-like part and is great fun. As you would expect, the closing moments of the piece are full of virtuosity and difficulties for the soloist who copes admirably and injects plenty of wit into her playing. This piece really is worth hearing and I am glad that Biliana Tzinlikova has rescued it from obscurity. There is plenty of interest in this music, there are trills and runs and opportunities for the soloist to shine which she certainly does. This is a piece I shall return to often, as it contains plenty of wonderful music. The fourth and final track on the disc is a cheerful set of variations on the fairly obscure composer Georges Onslow (whose music, especially his works for piano trio, is well worth seeking out). This starts off in the bass with a grumbling theme before the main theme starts properly. It’s a really rather beautiful aria to start with which gradually becomes more enthusiastic and cheerful before being subjected to variations. It is the second, jollier part which is the basis for this work. The first variation is a real finger-twister, requiring a large amount of flexibility by the soloist. The following variation is much more sedate and here is wonderfully voiced. The bell like effect at 4’40’’ is splendidly played. The quietude doesn’t last as the following variation sounds like a Presto and whips along at a rate of knots before leading to something more restrained again. The overall pattern is one of a fast variation followed by a slow one before another fast one. This pattern occurs throughout the work and the end of the last variation, which consists of lots of repeated notes, leads directly to the closing passage, which is a bravura tour de force for the pianist with plenty to keep her busy. The recording is a little bright and is closely miked but this does not affect the quality of the recording which is superb and very clear. The cover notes are interesting and contain a rather nice little essay about “bel canto” playing on the piano as well as details about the music itself. One miniscule criticism: it would have been nice to have had the variations as individual tracks rather than on one solid track, but this is just me being picky. Looking at Farrenc’s list of works, much of it unsurprisingly comprises of piano works, so there is plenty still to be recorded by some enterprising label and soloist. I’d really like to hear Biliana Tzinlikova record a second volume of the piano works, as she is clearly very happy playing this neglected but memorable music.